Nearly every Amazon Web Services (AWS) service has limits on how many resources you can launch in a specific AWS Region at a given time. AWS maintains service limits to help provide highly-available, reliable, and robust services to all of our customers, and to minimize billing risk for new customers. Tracking service usage against limits can help identify resources that are no longer in use and serve as a reminder to proactively request a service-limit increase. To help customers more actively track their AWS resource usage against service limits, AWS offers the AWS Limit Monitor solution, a reference implementation that automatically provisions the services necessary to proactively track resource usage and send notifications as you approach limits. The solution is easy-to-deploy and leverages the AWS Trusted Advisor Service Limits checks that display your usage and limits for specific AWS services. With the AWS Limit Monitor, you can receive email notifications or notifications can be sent to your existing Slack channel, enabling you to request limit increases or shut down resources before the limit is reached. AWS offers a solution that automatically checks service usage against limits and sends an email or Slack notification when usage approaches a service limit. The diagram below presents the AWS Limit Monitor architecture you can deploy in minutes using the solution's implementation guide and accompanying AWS CloudFormation template. This solution uses AWS Lambda to automatically refresh the AWS Trusted Advisor Service Limits checks to retrieve the most current utilization and limit data through API calls. Trusted Advisor calculates usage against the limit to determine whether the status is OK (less than 80% utilization), WARN (between 80% and 99% utilization), or ERROR (100% utilization). 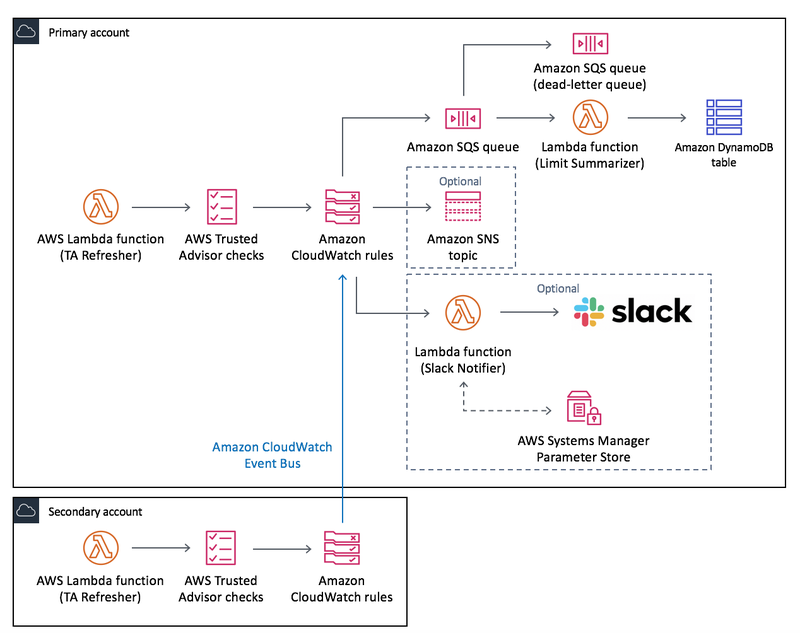 Amazon CloudWatch Events captures the status events from Trusted Advisor and uses a set of CloudWatch Events rules to send the status events to all the targets you choose during initial deployment of the solution: an Amazon Simple Queue Service (Amazon SQS) queue, an Amazon Simple Notification Service (Amazon SNS) topic (optional), or a Lambda function for Slack notifications (optional). If you enable Slack notifications during initial deployment, the solution will launch a Lambda function that sends notifications to your existing Slack channel. Leverage AWS Limit Monitor as a reference implementation that automatically provisions the services necessary to proactively track resource usage and send notifications as you approach limits. Receive email notifications or notifications can be sent to your existing Slack channel, enabling you to request limit increases or shut down resources before the limit is reached.